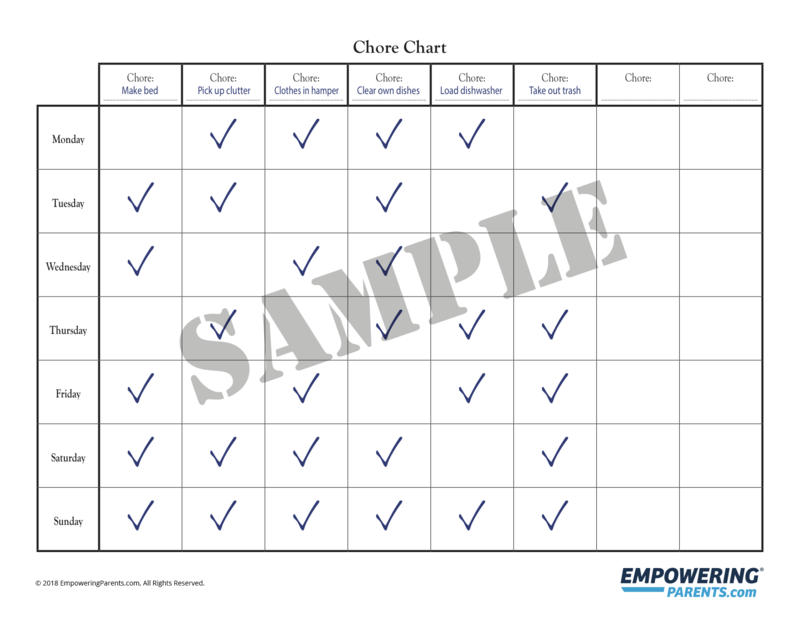 Chore charts are a very helpful way to organize your child’s responsibilities. They are a great visual reminder and help to make expectations clear. You can use a chore chart for most any age. Write your child’s chores in the boxes across the top of the chart. When your child finishes a chore, let them place a star, sticker, checkmark, or smiley face in the box that corresponds with the correct day of the week. Set a goal for how many stickers or checkmarks your child needs to earn each day. When your child reaches that goal for the day he/she will earn a privilege or a reward. The chart should be kept in a readily accessible and visible place — this helps your child remember to follow it. The front of the refrigerator is a good example, especially if other members of the family will be involved. Set realistic goals for your child. Make sure the chores are age appropriate and your child has a chance to be successful. It might take some trial and error to set a goal for your child. If he/she is never earning their privilege or reward, then it is not going to work. You want your child to stretch a little to earn the privilege or reward, but you want him/her to have days where he/she does earn it. This incentive chart shouldn’t be used as a consequence. Kids shouldn’t lose checkmarks or stickers. If they are not making good choices, then they simply don’t earn that star or sticker and they will have to try harder. Get your free Chore Chart for Children now!